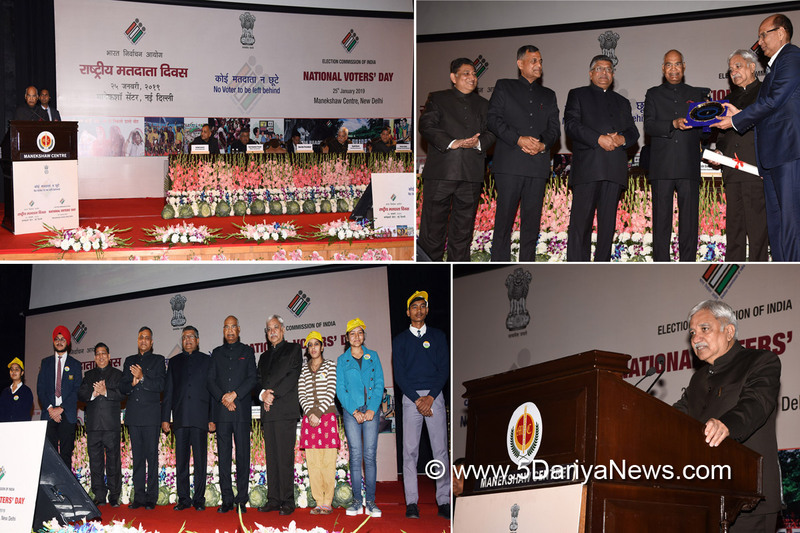 The 9th National Voters’ Day (NVD) was celebrated across the country today. President of India Ram Nath Kovind presided over the national level event held at Delhi. The theme for NVD 2019 was ‘No Voter to be Left Behind’ reiterating the commitment of Election Commission of India (ECI) in view of the Lok Sabha elections due this year.President Ram Nath Kovind hailed the varied interventions taken up by ECI for conduct of free, fair and participative elections. The President particularly appreciated the initiatives for reaching out to voters in the remotest corner to include their names in the electoral roll and to encourage them to exercise the Right to Vote. Referring to his recent visit to Gir National Forest in Gujarat where he came to know about setting up of a polling station even inside the Forest reserve for a single voter, Shri Kovind lauded the efforts of ECI to make every vote count in consonance with the theme of the year.Shri Kovind said that the framers of our Constitution set up the Election Commission as an independent and constitutional body one day before the birth of the Republic of India. This reflects immense regard and deep-rooted belief in democracy and the democratic spirit, he said. Talking about the electoral process – beginning with the preparation of electoral rolls and concluding with the declaration of election results – the President noted it is difficult for an ordinary person to comprehend the complexity of the entire process. The President said that the efforts of ECI have helped establish the credibility of Indian electoral system. It has helped strengthen the belief of Indian voters in the integrity, diligence, fairness and transparency of the election mechanism of the country. Shri Kovind said Voters and Election Commission are complimentary to each other and form the two most vital aspects of democracy. The President appreciated the various initiatives taken by the Commission under the SVEEP programme particularly mentioning the Electoral Literacy Club (ELC) Programme and the all Women Managed Polling Station initiative.The Chief Election Commissioner of India Shri Sunil Arora presented the inaugural issue of the new magazine of ECI, titled “My Vote Matters” to the President on this occasion. The President noted that the ECI magazine is most appropriately titled “My Vote Matters” as every single Vote counts equally in the formation of a government. The bi-lingual quarterly of the Commission hosts interesting and informative articles on many core subjects, new initiatives and topics of concurrent interest in elections, electoral processes and practices with the objective of developing a larger connect and interface with all the Stakeholders.Addressing the gathering Union Minister, Law & Justice Sh Ravi Shankar Prasad, complimented ECI for the stellar role played by ECI for strengthening the Indian democracy. He lauded the courage, commitment and foresight shown by successive Commissions for conduct of free & fair elections and noted that all should trust and believe the sanctity of the election process. Appreciating various initiatives of ECI for voter education and outreach he said voter education is integral to a good democracy.Chief Election Commissioner Shri Sunil Arora in his address, reiterated Commission’s commitment to make elections more and more inclusive, voter friendly, transparent and festive. CEC said that President’s esteemed presence at the occasion further motivates his team to fulfill the commitment towards Constitutional mandate for conduct of free, fair, transparent, robust and ethical elections in the country. Shri Arora elaborated the new initiatives being taken up for efficient and effective connect with the voters and for strengthening the elector confidence. Shri Arora informed the audience about the cVIGIL initiative that provides even time stamping as credible proof of complaints filed against violations of model code of conduct and expenditure, by empowering every citizen to click mere photo or video using a simple Smartphone.Delivering the welcome address, Election Commissioner Shri Ashok Lavasa, briefed the audience about the significance of the day, saying NVD is a day when we celebrate liberty and maturing of young minds into responsible citizens. Six young voters from Delhi were handed over their Elector’s Photo Identity Card (EPIC)s by the President today at the function. Speaking about the National Voters’ Day awards given out on the occasion, Shri Lavasa said the awards are given to honour those who have rendered exceptional service in the field of elections and contributed to developing best practices. Applauding winners of the National Awards the President asked them to keep participating to make elections free and fair. Congratulating the new voters who were handed over their EPICs today, Sh Kovind asked them to take informed decision while casting their vote and highlighted that their decision helps define the future of the country.Special Awards were given today to Indian Railways and Central Reserve Police Force for their contribution in helping transport personnel and material as also guarding the arrangements for smooth conduct of general and recent assembly elections held in 9 states in 2018. In addition, Awards were also given to CSOs and Media Houses who have made outstanding contribution in the field of voter awareness and outreach in these elections. (Details attached). Shri Lavasa also thanked all stakeholders including voluntary organisations for their support.Padma Bhushan MC Marykom, Member of Parliament and National Icon of Election Commission of India also graced the occasion. Members of Political Parties, Members of Parliament besides Diplomats from various countries and representatives from national and international organizations working in the area of democracy and elections attended the National Voters’ Day function.Chief Election Commissioners and senior officials from Election Management Bodies from Bangladesh, Bhutan, Kazakhstan, Maldives, Russia and Sri Lanka and Heads/Senior Representatives of International Organisations viz. Malaysian Commonwealth Studies Centre, U.K.; International Centre for Parliamentary Studies, U.K. and International Institute for Democracy and Electoral Assistance (IDEA) attended the function. The dignitaries also visited the new campus of the India International Institute of Democracy and Election Management (IIIDEM) at Dwarka, New Delhi.The National Voters’ Day (NVD) is celebrated all over the country on January 25 every year since 2011 to mark the Foundation day of Election Commission of India, which was established on this day in the year 1950. The main purpose of the NVD celebration is to encourage, facilitate and maximize the enrollment, especially for the new voters. Dedicated to the voters of the country, the Day is utilized to spread awareness among voters for promoting informed participation in the electoral process.